Storm’s a blowin’ in California – we’ve got inches of rain on the way and severe wind warnings here in San Luis Obispo County. I don’t know much about Harvest, but I feel like the remaining grapes must be blowing off the vines…there are tree branches down everywhere and the power is on and off. Our driveway is even littered with paint that has literally been blown/power-washed off the fence. Yikes. So what does a terribly rainy day remind you of, besides for dangerous driving conditions and possible flooding? To be honest, I’m considering popping open a bottle of wine – why not? 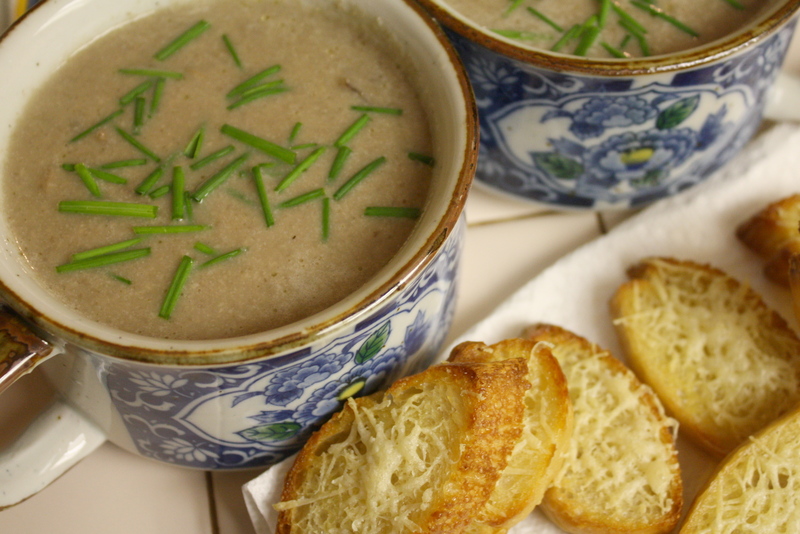 If you are not so inclined….soup is absolutely the next best thing! Luckily we have propane out here in the country and my stove still works, because this is a delicious recipe for a miserable day. Slice up all of the mushrooms. Heat the oil in a deep skillet. 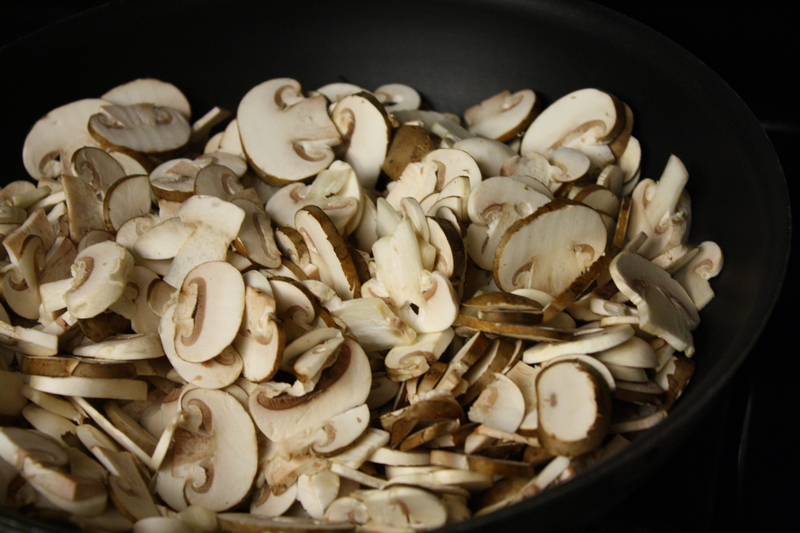 Add all of the mushrooms, stir to coat, and continue to stir as the mushrooms cook -this will take about 10 minutes. When lightly browned and softened, add broth. At this point, you can pour the mixture into a blender and blend until smooth, or you can do the same with an immersion blender if you have one. Return to skillet/pot, season with salt and pepper to taste, and heat on medium-low. In the meantime, prepare your Parmesan Croutons. Heat your broiler to 500 degrees. Slice bread into 1/2 inch slices and brush with olive oil. Place under broiler for 1 minute or until slightly golden. Flip and top with shredded Parmesan, broil for about one more minute until cheese melts. When the soup has reached your desired temperature, ladle into bowls. Snip fresh chives on top and serve with Parmesan Croutons. Optional: Swirl a bit of heavy cream into the soup before adding chives to make it extra-rich. This entry was posted in soup, Sweet Life Laur Original, vegetables, vegetarian and tagged bread, cheese, food photography, heavy cream, mushroom, olive oil, Parmesan, soup, vegetarian by Laura Zolnoski. Bookmark the permalink.